Luxury draperies and curtains don't have to be a sheer indulgence. 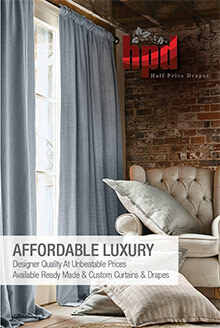 Half Price Drapes provides a collection of discount drapes and curtains, rods and accessories that are both exquisite and affordable. Use code - HPDCAT20 - at checkout on the Half Price Drapes website.